The bibliophile is always an easy buy, as there are always books a plenty and one can never have too many. (Do you hear how I should be a poet?) 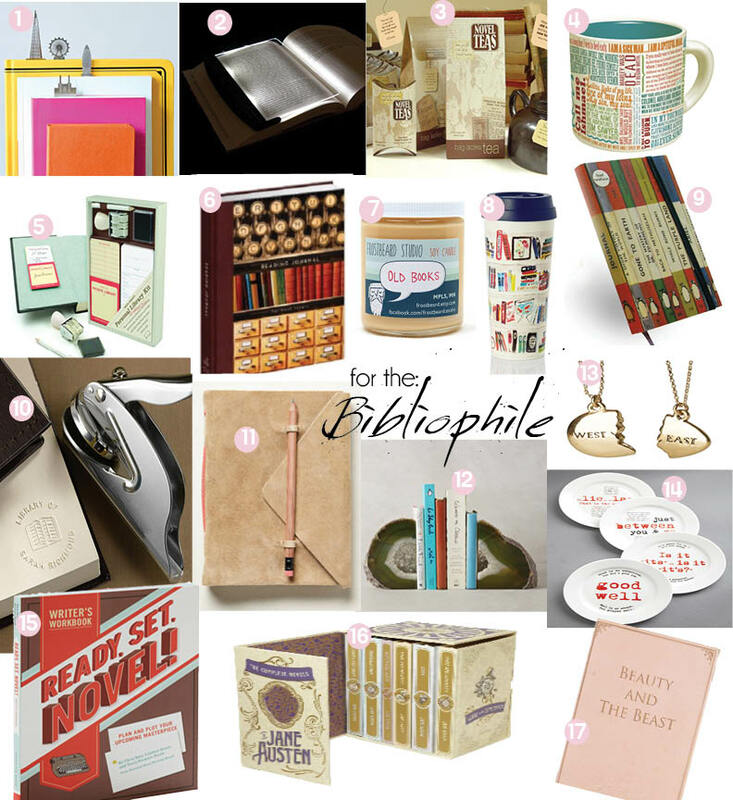 But besides the obvious, here are few clever ideas that any book lover would love to accessorize their library with. LightWedge LED Book Light is easy on the eyes and only illuminates the page you are reading so as not to disturb any others around you with bright lights. Novel teas Every bibliophile is perpetually accessorized with a good book and a steaming cup of tea. It is science; one does not exist without the other. And how kind of you to enhance their bookish accouterments with these clever literary tea bags. Great First Lines Mug And where better to put literary tea bags but within a literary mug? Personal Library Kit There is no emotional paradox quite like the one that follows upon the heels of the question, “Can I borrow your book?” Bibliophiles simultaneously become filled with both the pleasure of sharing a beloved novel and the dread of potentially losing it should it fall into the wrong hands. Alas, a personal library kit is the nostalgic solution we have all been waiting for. Reading Journal A comprehensive reading journal full of creative analyses about every literary thing you could thing of. From current reads to favorite books, personal reading style, reading suggestions, to your favorite place to read, there is no stone left unturned. Book Scented Candle this Etsy shop has figured out how to stuff all of the aromatic ambiance of a library right into a jar. Bookish Thermal Mug A painterly library adorns this thermos for the bibliophile on the go. Customizable Library Embosser Just a subtle reminder for all of those borrowers and forget-to-give-it-backers. Gatsby Necklace This clever literature necklace is one of those perfect bestie gifts. Or give them both sides if you’re especially generous, because necklace layering Gatsby style is the best kind of necklace layering there is. Grammarian Plate Set Four ceramic dishes simultaneously celebrate food and grammar, which are actually equally satisfying. Why not appreciate a pastry over the correct use of your and you’re? Ready, Set, Novel remedies writer’s block by supplying interactive guidance and inspiration, via exercises, quotes and plenty of space for plot outlining and writing. Jane Austen Set is an elegantly presented box set of Jane Austen’s best works.